I recently acquired 11 deeds from Grafton County, New Hampshire concerning Edward Marden Sr & Jr. Many thanks to my new friends at genealogyfreelancers.com and Tricia Thompson, CG, the Genealogist I hired to retrieved the deeds. It was a very smooth experience. K’chi Wliwni Nidobak – Great Thanks My Friends! I will explore the deeds in chronological order. First we have the deed for property purchased in Concord (Lisbon). This was a very nice find and here is why. 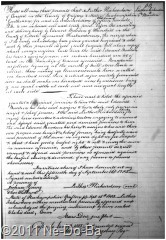 He purchased 100 acres of land in Concord (Lisbon) from Luther Richardson. He is referred to as a husbandman (farmer). He paid 15 pounds “cash in hand” for the land, so there was no mortgage. His property was located along the Ammonoosuc River starting at the mouth of Millstone Brook. The deed is dated 15-Sep-1785. The deed is recorded 16-Jan-1815 (30 years later!). Luther swore he had lawful title to the land and promised to defend against any claim to the contrary. Earlier, I explored a document signed by Edward at Concord on 26-May-1785. The above deed suggests that Edward lived at Haverhill sometime between the end of his enlistment in June 1783 and May of 1785 when he signed the document. An earlier investigation suggested Edward Jr. was born about the year 1785. Perhaps he was born in Haverhill. It is also very likely that Edward married his first wife in Haverhill, unless he married her while he was serving in the military during the war. A marriage during the war is not impossible, but seems unlikely to me because of the type of service Edward was involved in. If it was an in-service marriage, I suspect it took place while he was serving his final enlistment with the NH Continental Line in western New York. Some women did followed the soldiers as they went off to war. They were called “camp followers” and a number of other not so nice things as well. Some were in love, some were “ladies of the night”, and I suspect some were in it for the adventure. Camp followers helped the men with cooking, mending, laundry, nursing, and a number of other domestic chores. Starting a family during a war in which you have a dangerous job seems an unwise thing to do. On the other hand, the soldiers had no idea how long the war would go on or if they would survive. It is somewhat understandable if Edward did not wait for peacetime. Does anyone see other possibilities?